+ Stella Maris +: Metropilitan Kirill is the New Patriarch of Moscow and All Russia - Deo Gratias! 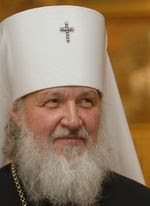 Metropilitan Kirill is the New Patriarch of Moscow and All Russia - Deo Gratias! The delegates to the Church Council meeting in Moscow have elected Metropolitan Kirill as the 16th Patriarch of Moscow and All Russia. He received 72% of the votes. He needed just over half of them. There were three candidates, but one withdrew in favour of Kirill only two hours before the voting. The announcement was accompanied by the traditional peal of bells of the Cathedral of The Saviour. It was reported on Russian television that the The Softener of Evil Hearts Mother of God Icon was streaming myrrh during the election. This Icon is always present at the election of a new Patriarch. 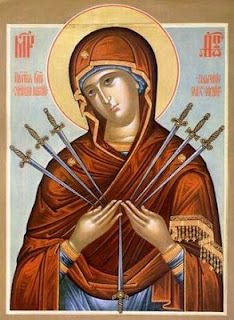 It is seen as a prophetic Icon, promising a time of peace and charity. Because of this important and encouraging event, I hope to post more about this and other icons of Our Lady in the near future. Thanks be to God. It will be through Russia that Christianity will be saved in the final battle of good verses evil. Thank-you for this beautiful picture, I wonder what myrrh represents? I remember that myrrh was one of the gifts of the three wise men to the Christ Child.